Yoga fans protest a rumored "yoga tax"
Yogis have a reputation for being calm, but don't be mistaken. They get mad. And when they get mad, they do yoga -- in the middle of the morning rush hour at Freedom Plaza. They were protesting a so-called yoga tax, rumored to be under consideration by the D.C. Council. The proposal actually calls for a new tax services, including yoga services and health club memberships, according to the Washington Post. Critics said it would mean a 6 percent to 8 percent sales tax on yoga classes, and all those yogis aren't happy. 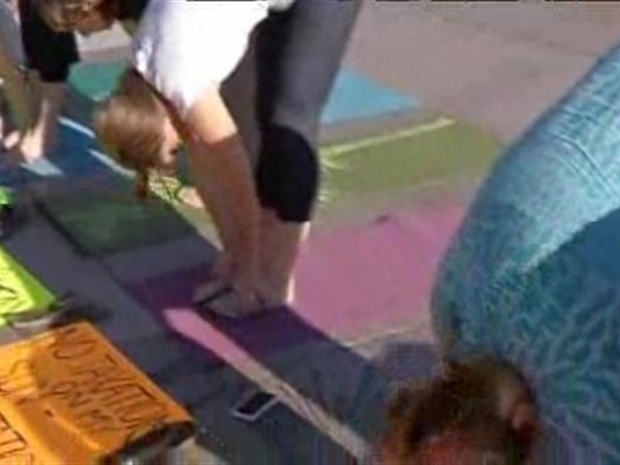 Yoga fans are protesting a proposed yoga tax in the District. We will be wearing BRIGHT COLORS, doing GUERILLA YOGA, and holding SIGNS with cheeky sayings. Those crazy yoga people! For the record, we don't know what GUERILLA YOGA is, but it sure sounds like a fearsome concept. We do, however, know what "cheeky sayings" the organizers were talking about. The e-mail suggested "Yoga is More Important than Money." These people are probably more flexible than they are creative. 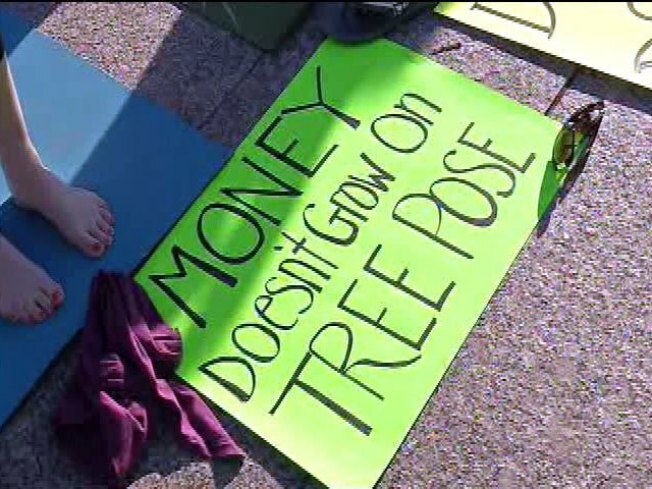 More fun signs: "No Taxation on my Sun-Salutation" and "Money Doesn't Grow on Tree Pose," which must be some kind of yoga inside joke. Ward 6 Council member Tommy Wells said council members are being inundated with e-mail complaints. On the WAMU "Politics Hour" Friday, Wells said the tax idea came from an advocacy group, but there is no planned legislation. "Nobody from the council has proposed that," he declared emphatically. "The mayor's not proposed that. There was a think-tank that said, 'Hey, what about charging for services instead of just goods?' That is not in front of the council and that's not something we're voting on. Nobody's proposed it."